The Red Strat Blues Lesson by Kirk Lorange. The Red Strat Blues - The TAB and Backing Track. Have fun with this. As you can see, I play with my fingers, but you can use a pick too. Use whatever technique you have to play the double stops. I did my best with the TAB. I used Guitar Pro to generate it and made a rough backing track that emulates the original (which I can't find anymore) in the same program. You'll see all kinds of odd looking symbols in the tab. Ignore them. They're a result of my trying to get the timing right for all the ad lib lines I played. I included on the video a bar count which matches the bar count of the TAB and I also indicated the chord changes. Most of the chords are treated as dom7 chords, even 9th, but I kept the names simple in the movie. The TAB is split into 5 passes one for each 12 bar pass through the tune. An extended backing track along with a mp3 of another take I did years ago on my Telecaster are both linked at the bottom of this page. Remember: This video shows just one random one-take improvisation over this progression. The trick to being able to invent lines like this, on the fly, is to be able to see the fretboard as 'the chord'. I gave up on scales many years ago ... too much thinking involved ... and since we need to know the chord anyway, I started applying a different mindset way back then. The approach is nothing new -- follow the changes -- but that's easier said than done. The gist of it is this: use chord tones to outline your lines, riffs, licks ... whatever you want to call them. There's no need to restrict yourself to JUST chord tones, but when you use them as those important-beat notes, those launch and resolve notes, you will never go wrong. As the chords change, so does the matrix of chord tones. With enough time under your strap, and with the ability to see the fretboard as a chord, the process of playing a solo becomes more of a 'join the dots' process than juggling scales and modes or sticking to a 5 or 6 note 'box'. Not only that, sticking to the one Pentatonic scale fails miserably over more complex changes. Many years ago, after much hair-pulling, I came up with a simple way to 'see' the fretboard as one long chord. It is the subject of the PlaneTalk Book/DVD/Slide Rule package I sell. I've been selling it online since 1997 and I've never had anything but positive feedback on the lesson it teaches. If you take the plunge and order it, you will never look back, I guarantee it. 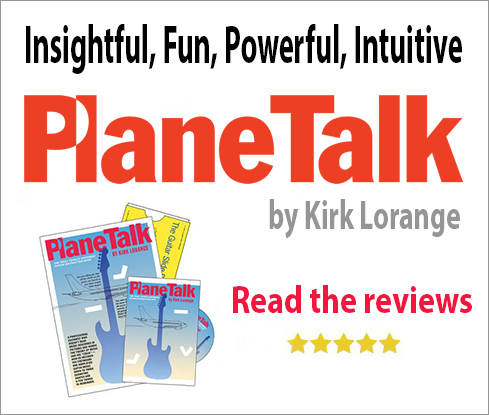 Find out more about PlaneTalk here. To get the printable PDF of the TAB and Notation of all 5 passes, I will be charging a small fee of US $4.95. Click here to order it.